What's wrong with this picture? It is February 24th, that's what is wrong with this picture. It looks and feels like mid March. (By the way, this isn't my yard but a neighbors.) I feel responsible for the weather. If I hadn't knit all those gloves, mitts, and hats, there would be snow on the ground. I've got quite a few new students and lessons are slowly arriving for me to review. I've had some lovely lessons lately which has been very nice. I decided to do a tubular cast on for the sweater I'm knitting for Cast On. There are several ways to do a tubular cast on but I get the best results when with the crochet chained method. The problem with this is that most sources will tell you that you can only work it on an uneven number of stitches. If you are doing K1P1 ribbing and it will be seamed, this means you have to either add or remove a stitch since the pattern won't line up if you have an uneven number of stitches. I decided to try and add a stitch while doing the cast on. It was mindlessly easy. I just made an E loop at the end of the cast on. I thought it might not look very good but it fit in just fine. Most instruction will tell you to work the first stitch as a knit stitch and then with the yarn held to the front slip the next stitch. Does it really matter if you knit the first stitch? No. 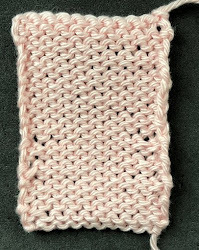 I decided for this sample to purl the first stitch since the loop from the crochet edge sort of looked like a purl bump. The world did not come to an end. If you've worked a tubular bind off before you know that you continue to work one stitch and slip the next for at least two rows. I decided to work this for three rows. Again, the world did not come to an end. Here's a photo of the waste yarn removal. Here's the final product. Notice that there is a slight bump at the lower left edge where I made the e-loop. This will be enclosed in the seam. Salon will be on Sunday from 2-4 pm. I'm finally getting to one of the Met Simulcasts. They are doing Dvorak's Rusalka which I have never seen. While everyone in Lexington will be at the game I'm going to be in the theater! The sweater is almost finished. I'm using Baah Sonoma in California Poppy. This color reminds me of my mom. She loved bright colors and she always had California Poppies in the yarn. They are such a sweet flower. The body is finished. One side has a lower neckline and I designed it so you can wear that in the front or the back. The sleeves will be picked up and the cap will be shaped by short rows. They'll be 3/4 length. I used a tubular bind off for the necklines. This is the front (or back). I think I like the lower neckline in the back myself.